The FIA World Rallycross series’ trip to the Estering this weekend was predictably nutty, with plenty of gentle bumps, taps and whacks for the whole family. Here’s some of the most ridiculous love taps from over the weekend. Wheel-to-wheel rallycross cars remind me a lot of NASCAR’s stock cars insofar as they seem to be made to whack into each other while leaving the driver unscathed. Body panels rip off, cars spin out into the barriers, cars punt into each other—and thankfully, this rarely seems to harm the guy inside. Consequently, you can have starts like this one from Day 2 at the Estering and not feel like you’ve just watched something terrible, but rather, feel like it needs The Benny Hill Show theme dubbed over for maximum effect. This start from Day 2 is mesmerizing. It’s like ping pong with nutty little hatchbacks. Really, though, this corner seemed to catch everybody out. The nonchalant broadcast announcers definitely add to the amusement level. Things that would send you into full-on rage mode with nearly any other kind of car are just okay here. Acceptable. Part of life. 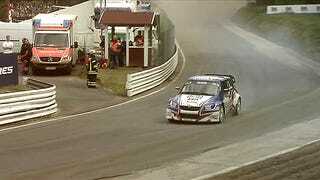 “Hedstrom had a nightmare on the brakes and parked the car on the very steep banks.” Uh-huh. Parked the car. Because that’s totally how I park: by wipeout. If you ever get a chance to peek into a rallycross hauler, take a look. There are stacks on stacks on stacks of extra body panels for in case of probable destruction. Check out the highlights from Day 1 and Day 2 at the Estering. If this doesn’t make you want to play bumper-cars in an overpowered hatchback, I’m not sure we can be friends anymore.